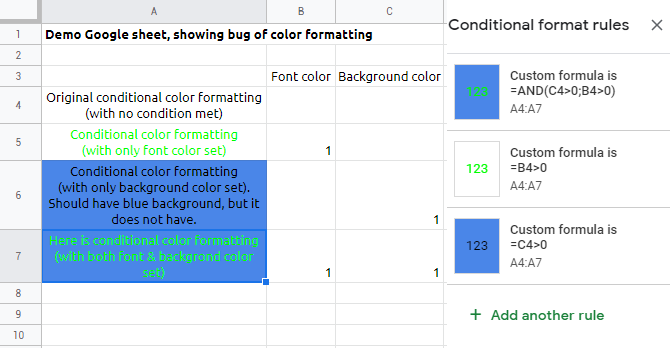 If a Google Sheet cell has 2 Conditional formattings, one which changes only font color, one which changes only the background, only the first conditional formatting affects the cell. The reason might be because when the color is set to NONE, it is not interpreted as transparent. When I set a font or background color to NONE, it should be transparent, so other conditions could affect the transparent part. An idea on how to fix it? Is there a way to make Google Sheet chart in Google Slides have a transparent background?